As a fellow fan of the DGC franchise, I actually discover Di Gi Charat through the Nyo opening “Dynamite I-N-G”, and yet, Nyo is the final DGC anime I viewed upon. What do I think of this anime? 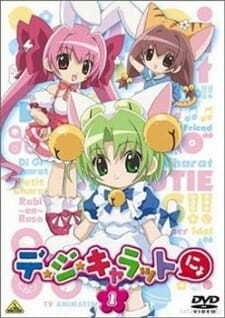 Despite being aim more towards kids, Di Gi Charat Nyo is a decent remake of the original series. Luckily, characters like Dejiko, Puchiko, Usada, Gema, and the BGG gang return. Heck, even Mike and Rinna from Panyo Panyo appeared in this series. Rather they were cameos or not is debatable but that's a story for another section. As for the new characters, they're pretty alright. I like characters like Aqua and Yu-Rei, I very glad to see them. They are some characters I didn't like (Kumagaya Kintarou) but hey, those are the type of characters that aren't meant to be liked. Outside of the OP, ED, and some insert songs (Usamimi Chan for example), majority of the background songs aren't that memorible. Now here's the kicker, the songs I did mention are really catchy. Yes, I'm adding licensing into this and you'll see why... Anyways, in the Japenese dub, the original cast for the characters return, which is nice to hear them. ANYWAYS, onto to the licensing, and BOY there is a lot to say bout this and the way it was handled. During the time, Bandai only licensed and dubbed 72 episodes.... I am not joking when saying this. They left the other 32 episode unlicensed. That has to be the dumbest thing I have witnessed from a company like Bandai. And it's mind boggling because it's Bandai! The same people that gave us Gurren Lagann pulled this move! *sigh* This is why it's debatable rather Mike and Rinna were cameos. I'm hoping that Sentai Filmworks re-license this series and get all 104 episodes. It doesn't have to be re-dubbed. A re-license is all I'm asking. All and all, Di Gi Charat Nyo! is a entertaining anime overall. If you like the original series or want to see something funny, I suggest giving this a try. If you're looking for a ground-breaking story with heart throbbing emotions, this is not for you. This is a fun series in the spirit of the original. It is a little more toned down for children though there are a few adult themes and humor scattered. The most aggravating issue in this is that the american release never finished the series. It is worth checking out though even if you need to download the last 30. Di Gi Charat Nyo still exist?? ?